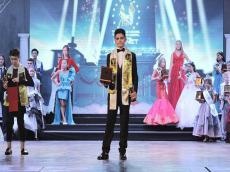 The 14-year-old model, Raul Abbasov, won the Grand Prix of TOP Teen Model of the Planet – 2017 in Batumi, Georgia. The jury members highly appreciated the performance of the Azerbaijani model, awarding him the highest scores, Trend Life reported. The young model has already taken part in many domestic competitions, including Kids Fashion Show. Abbasov will soon take part in the next international project. Representatives of more than twenty countries took part in the Grand Prix of TOP Teen Model of the Planet and presented national and classical clothes. Estonian model Maria Vechtomova was named the winner of the contest among girls. TOP Teen Model of the Planet – 2017 aims at the establishment of bridges of culture and mutual understanding between the growing generation of different peoples, the propagation of national traditions of countries and disclosure of creativity. The project`s national director is Agil Mamiev, and the coordinator is Vugar Safarli.